The Dead Don’t Care, but Thomas Lynch Does. Before Lynch became a poet, he was learning to become an undertaker. Born and raised in Michigan, Lynch grew up in a large Irish-Catholic family that happened to own Lynch & Sons Funeral Homes in Milford. He went to Brother Rice High School in Bloomfield Hills and then went to Oakland University to study English. However, he dropped out and instead studied at Wayne State University in Mortuary Science. Although he never graduated, Oakland University awarded him an honorary doctorate for his work. Lynch also traveled to and from Ireland to get closer to his heritage, while balancing his desire and love for poetry with his dismal career as an undertaker. In between wakes and funerals, Lynch would submit poetry and become published in journals in Ireland and in the United States. He fell in love, changed his mind, fell in love again, and had three sons and a daughter. In addition to the several books of poetry that he has published, his memoir, The Undertaking – Life Studies from the Dismal Trade won the American Book Award, The Heartland Prize for Nonfiction, and was a Finalist for the National Book Award. However, life wasn’t easy. He had to face many deaths throughout his life, and not simply because he was an undertaker. In addition to being the man grieving people came to do bury their deceased loved ones, he had to deal with the loss of his parents, whom he helped prepare for burial and/or cremation with the help of his brothers. Now, thanks to Lynch’s success as a writer, the family business that he took over after his father’s passing has become more recognizable and has expanded from one location to six. I was only able to attend the reading on the 27th due to work and school schedules. 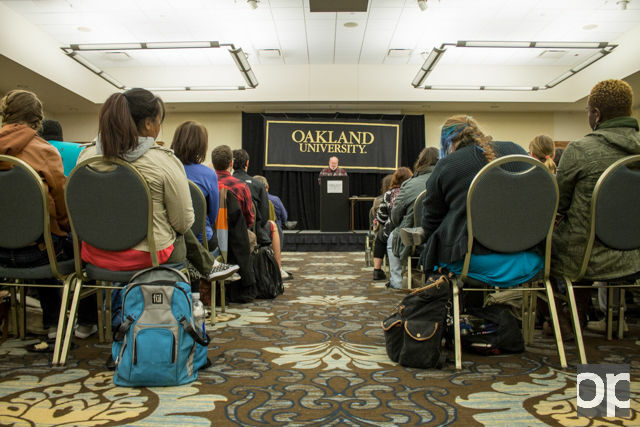 The reading was held in Banquet Room B in the Oakland Center, and it was filled to full capacity. Easily 100 students flooded into the room, sitting on the floor when the seats were all filled, to listen to Lynch read. The room was silent, enthralled by the stories he told of his life growing up before diving into poems and prose. Now, I must admit that I had read online reviews to get a sense of what I was jumping into before the reading, and I was surprised to see among the rave reviews many people criticizing Lynch for “being a jerk” (and that is putting it in a nice way, based on the crude way his critics on GoodReads are). However, I was pleasantly surprised to find that he is by far one of the most humble, thankful, and insightful poets I’ve ever had the pleasure of meeting. “What a kind, generous, and vaguely obituarian introduction,” Lynch said as he came up to the podium. He thanked everyone for coming, remaining completely humble that such a large crowd welcomed him. The he went on to tell vignettes about his life, starting off with a story of how he would write sonnets to his friend on postcards. Eventually, he started writing thirteen lines instead of fourteen because, as he put it, “once you get older, you forget how to count.” He then read aloud one of the poems he wrote to his friend, which was far too long to put on a post card (and by that time, postage rates had risen and they weren’t writing often to each other and needed longer poems to convey their thoughts.) He also told us about his father who fought in WWII, and how he never spoke of it until very late in his life shortly before passing away. He followed the story with a poem that the war story where he had to walk among the horizontal bodies and kill the survivors. I now understand that the critics on GoodReads were mistaking his style of writing, which is crisp, poignant, and concrete, to be a reflection on his personality – as if he was as brash and to the point in person as his narration was. Obviously, they weren’t aware that the speaker of a poem, or the narrator of a novel, is not necessarily the poet or author himself. That being said, it was nice to finally put a face to the name when I asked him to sign my copy of his memoir, since I was able to interview him a few weeks prior to his visit to OU via e-mail. Lynch is a very busy and always traveling man, so I wasn’t going to bombard him with questions. Our conversation was brief: a set of question sent out, and a list of short answers (much like his writing style) received. Listed below are the topics we’ve covered. What was it like growing up? I am from a large, Irish-Catholic family. My parents met in the fifth grade in Detroit, wrote one another all through WWII and married when my father returned from service with the US Marines in the South Pacific. He went to mortuary school at Wayne State and to work as a funeral director and together they raised nine of us in Birmingham, Troy, Bloomfield Hills. Mostly I read and write, travel some, fish, beleaguer my grandchildren. When did you graduate from Oakland, and what was your major/minor? Reading, I’d say. It was always like having a very good listen to someone’s best thoughts. Tell me more about your job as a funeral director. Does it affect your writing in any way? Well, I’ve written about it a good deal. I’ve always thought it was essential human work — getting the dead where they need to go and the living where they need to be. [As for affecting my writing,] yes, yes it does. Which do you prefer: writing short stories, essays, or poems? Are they similar or different to you? What makes essays different from short stories? I just like writing, putting language through its paces. Hard to improve on a poem that gets ‘accomplished’. Essays seem like a long walk in the world and a conversation you keep having with yourself. Stories are driven by characters. You sort of turn them loose to see what they’re going to do next. You’ll be reading from your memoir The Undertaking: Life Studies from the Dismal Trade. What was your inspiration for the book? How long did it take to complete it? I wrote the title essay for Gordon Lish in 1987, for his journal, The Quarterly. My father died in 1992 and I started writing the other essays after that, mostly at the request of John Lanchester at the London Review of Books. They were finished by 1996. I didn’t think I was writing a book. I was just writing pieces for publication in periodicals. Suddenly I noticed I had a book. What was your writing and editing process like? Do you prefer one over the other? Write, revise, revise, re-write, submit for publication, revise on rejection or acceptance, revise some more, write some more, revise, revise. How did you get yourself published? Did you find it difficult? I sent out batches of things I’d written to journals where they published stuff. Yes, I found it tedious, brain warping, essential work. What is one piece of advice you’d give young writers who are trying to get themselves published? Read, read, write, write, revise, revise, buy stamps or work the Internet. Repeat. Review. However, one of the best pieces of advice I heard from Lynch was not during our interview. Instead, it came when I was able to meet him face to face and have him sign my copy of his memoir. He asked what I did when I wasn’t writing up articles for The Oakland Post. I told him that I write novels, and that I was currently in the process of sending out queries to agents in hopes of getting published. Jokingly, I told him that I was already getting plenty of rejection letters. “Don’t let that get you down,” he told me as he signed “To Danny,” before asking me how I properly said my name and fixing it. I assured him that it wasn’t bothering me and that my books were going to be published no matter what – whether it’s through self-publishing or through a publishing house. “That’s the right kind of attitude to have,” he said with a smile as he handed me back my book, and that was all of the assurance I needed. Some unique about his style of writing is the sense of being an observer throughout the book. As readers, he is opening up the doors to his life and letting us walk through while he leads us with his stories. There is an air of sophistication and professionalism in his style of writing. At times, Lynch’s narrative voice can come across as pessimistic, cold, and distant. His favorite line to remind the readers is that “the dead don’t care.” However, Lynch is in fact very sympathetic and humane throughout the book. He’s not a pessimist or an optimist, but instead tells the truth and faces the facts of life to the best of his ability. The reader simply has to pay attention to the details to notice when Lynch is showing his emotions. Speaking of the subject matter, it is extremely interesting. He takes the concepts of religion, life, love, and death, and breaks them down into mundane moments: his love and fear for his children and their constant safety, his friend who wrote a sensual poem about an “Artichoke,” the girl who was struck by a falling headstone, his mother dying of cancer, preparing the wake for his own father’s funeral, and the boy who committed suicide over a break up. These are crammed into the first few chapters, and the stories continue to tug at your heart strings as you read through the novel. However, he is clear to emphasize that he is not some sick person who finds joy out of these stories. Lynch reminds the reader that he is simply doing his job, and that his job is to help the grieving cope with their loss. One of my favorite aspects of the book was the images that were placed in between chapters. These photographs and drawings help guide the reader and prepare them for the story. It adds a bit of a flair to the memoir that really makes it shine. Overall, Lynch’s memoir easily deserves the numerous awards it has received, and it is a book I would recommend to anyone who wants to experience a poetic mortician share his meanings of life and death. Fan World 2016: Was it worth the trip?